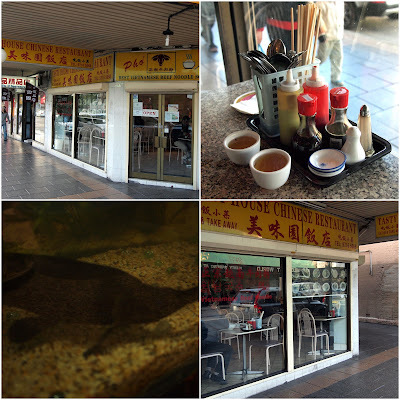 We frequent Tasty House on Liverpool Road in Ashfield specifically for the Chinese noodle soup with chicken and pork ribs on the side, medicinal and just a little naughty. Tasty House is a casual hole-in-the-wall restaurant with a menu that is half Vietnamese and half Chinese. The menu isn't particularly exciting (see photos below) but we are hooked on menu items #25 and #26, fried chicken noodle soup and pork rib noodle soup, both $9.50. The soup comes in a big bowl with plenty of fluid, just the way I like it. The broth is plain, refreshing, reyhdrating. I have a bit of a flu so this like medicine. The true joy of these soups is that the protein is served on the side, it is very well cooked, very tasty, and in generous portions. It's like two dishes in one. Often we we find our bodies want the rehydrating medicinal benefits of noodle soup, but our taste buds want some fried protein. #25 and #26 fits the bill perfectly. This fried chicken above is delicious. A lovely sweet dipping sauce for the protein. This place always has plenty of punters. Lots of people seem to come for pho (there's a SMH review on the window recommending the pho) but we just can't get past #25 and #26. Iced coffee. Strong and not nuclear sweet for a change. $3.50. Yum. Tasty House Menu - click to enlarge. Tasty House Chinese Restaurant is at 297 Liverpool Road, Ashfield. Ph 9716 5668. We also recommend the fruit & veg shop across the road.